Monument purse set in Italy.Leaving the house, we be sure to take a purse and a bag, travelling – a suitcase or backpack. These things always accompany us. So why not put a monument to them? 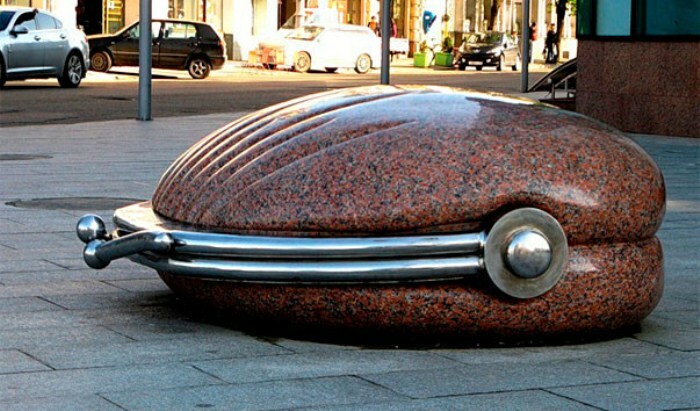 The 6 most original ideas that managed to bring sculptors from Russia and Ukraine. 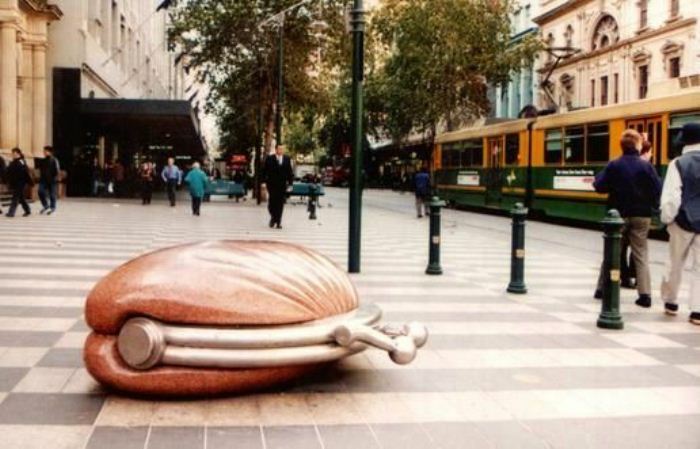 The monument to the purse, Melbourne (Australia).Have you ever heard the expression «sit on money»? In Melbourne it is possible to try, because one of the Central streets there is an unusual shop in a vintage purse. The idea belongs to Simon Perry, it was the work of the sculptor for participation in city competition on the most original shop in 1994.The wallet is made of granite. Despite the fact that the material is not pliable and craftsmen have managed to create the illusion of soft folds. Clasp is stainless steel. Public purse.Perry’s idea was so interesting that the Public purses began to appear in different countries of the world, and Russia is no exception. In Krasnodar, the same monument was installed in 2008 in conjunction with the opening of the 215th anniversary of the city. It is believed that the purse – a symbol of financial well-being of citizens. Anyone can sit on it or RUB it on your real wallet, and then the crisis, they sure don’t. Bulldog with bags. Monument in the shopping center Greenwich in Ekaterinburg.This sculpture is installed in the shopping center Greenwich in Ekaterinburg. French bulldog on a bench, guarding things left by the owner. 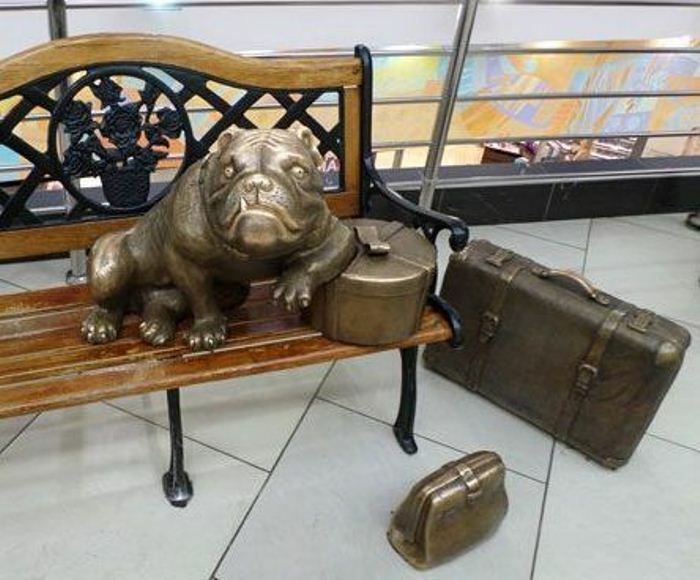 This monument is an ode to grocery shopping, because the dog is waiting patiently for the hostess who is still continues its way from Department to Department. Work and optimism Amur entrepreneurs.In dashing 1990-e years, each survived as best they could. It then appeared EN masse traders – traders who bought goods abroad and sold at home. Then «businessmen» looked ugly: tracksuit, bag money belt and a huge trunk with things in each hand. In Blagoveshchensk flourished resale things from China, because the city Heiho is very close – just need to cross to the other Bank of the Amur river. The author of the monument to the Shuttle – Valeriy Razgonyaev, he installed near the entrance in the main city market. 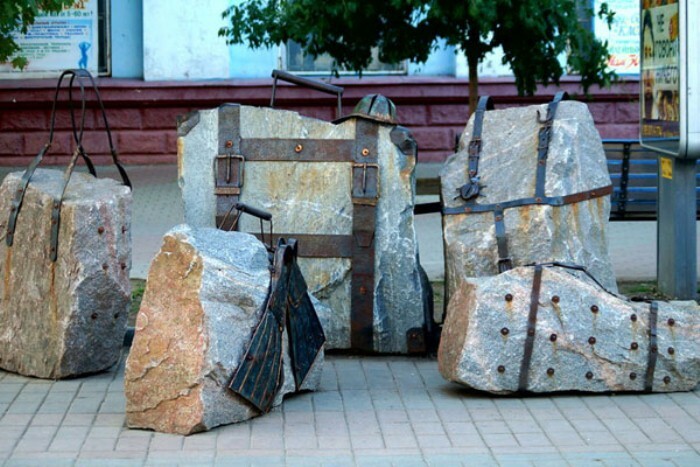 Bag a monument in Sumy.A bag full of coins to the top, a symbol of the Ukrainian city of Sumy. According to legend, in 1655, here the town was founded by Cossack settlers. They took this decision because he found three hunting bags, filled to the brim with coins. The find was considered significant and decided not to continue their journey in search of a better place. 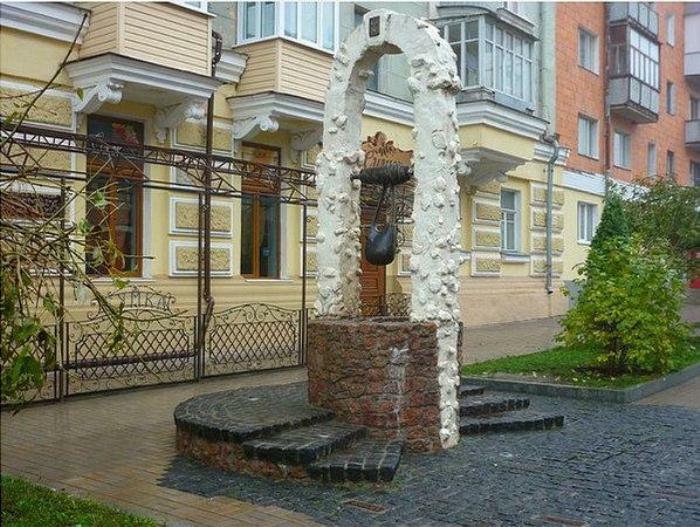 Monument-fountain in the form of bags of coins.To 335 anniversary of the founding of city residents Sum made a gift – the original monument-fountain. It is believed that if you wash with this water, all financial difficulties will be resolved. 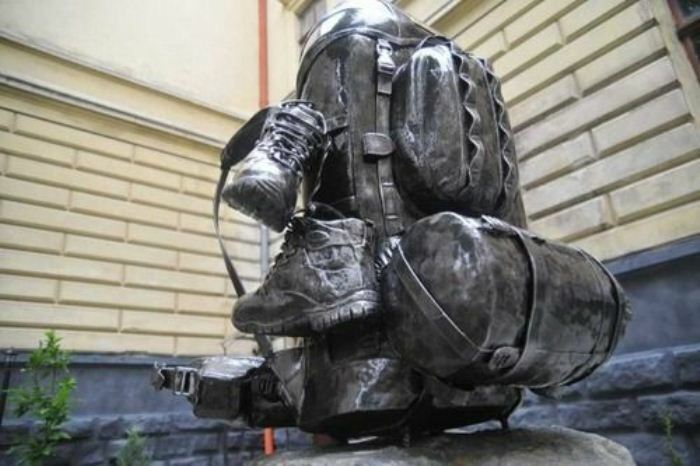 The monument of the tourist backpack in Lviv.Lviv – a city of tourists and travelers. The Carpathian mountains are close, so many begin their journey to the mountains from that city. 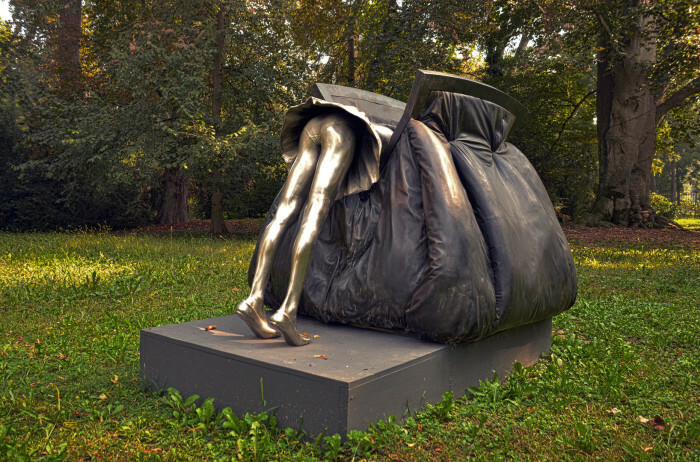 In 2012, near the Lviv national University was installed this sculpture and fell in love with the townspeople and tourists. By the way, the backpack is made in such a way that it can «try on». 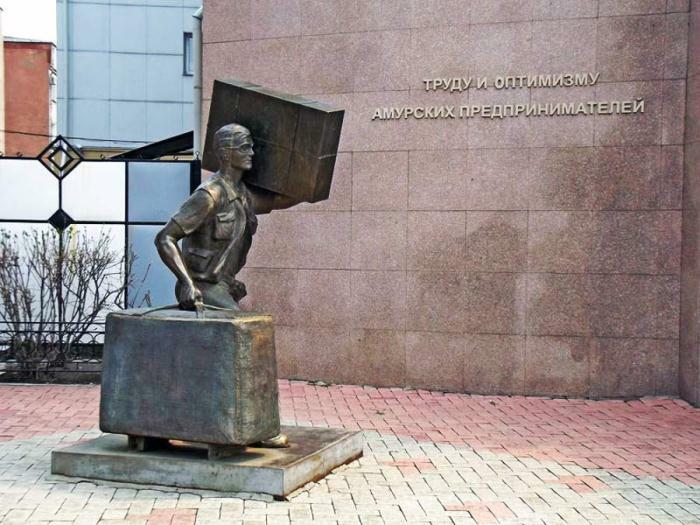 The monument tourists with suitcases in Berdyansk.What we take with us when we go to sea? Bags, bags, trunks, suitcases… so Many things that my head is spinning, but in the hands still have to carry even with the umbrella hat and flippers. Here is a monument vacationers in 2011 opened in Berdyansk, Ukrainian town on the Azov sea coast. Built of granite slabs and metal parts. It was nice, the monument is loved by the vacationers. Monuments have long ceased to be associated with monumentality. 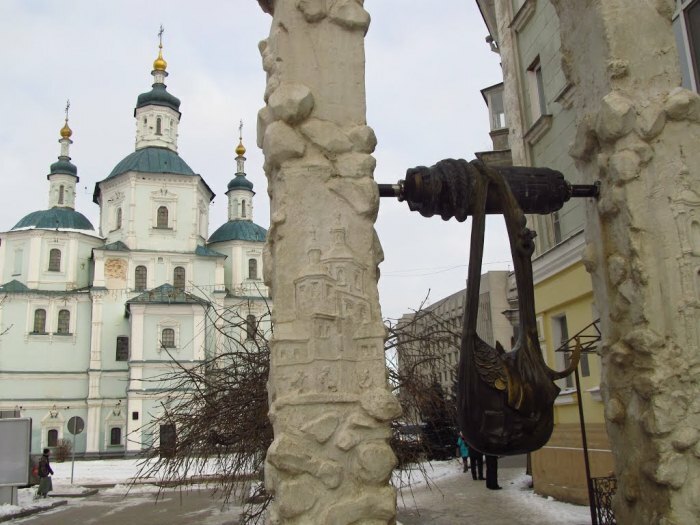 Our review of the Most curious monuments of Russia — proof.